A monkey, caught in a monsoon, finds shelter in a cave amid the rubble of a temple. The monkey is not alone. A lion, a jackal, a turtle, and a dove bicker in the cramped space, until a statue of Buddha comes to life. "Hush, children, hush." Buddha says. "I will tell you a story to pass the time." From the tale of the clever monkey outwitting a hungry crocodile to that of a bird and turtle rescuing a friend, the six amusing parables told by the Buddha will introduce young readers to the famous cycle of fables in Buddhist literature known as the Jatakas, or birth stories, which Buddha originally told to his disciples to illustrate his teachings. 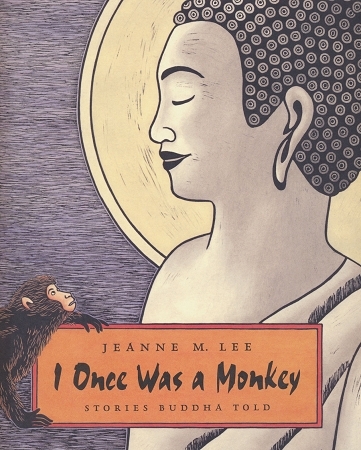 Joined with stunning linocut illustrations, Jeanne M. Lee's retellings form a book notable for both its beauty and its wisdom.